Today is world saving day this day is devoted to the promotion of savings all over the World. We all accept western culture and celebrate days like valentine day but unfortunately we don’t even remember World Savings Day in our country. This may be due to we are very busy or may be least interested in day like this. In some country World Savings Day is always a day of great excitement, when Banks distributed free piggy-banks to children, and inspired them to set savings goals, instilling a sense of financial responsibility into their young minds. Handing personal finances is a great life skill at any age, and kids that are taught to be financially responsible are generally better equipped to make better financial decisions later on in life, as well as establish good savings habits. Here are some ways to get your kids started on October 31st with some World Savings Day activities that will pay off big time for them. We recommend encouraging your children to use piggy bank from the child hood. This will serve multiple purposes. Your children will enjoy putting spare change or part of their pocket money into their piggy-banks. It may be visual incentive to them of how much money they are accumulating. It will cause good saving habit in to mind of child. Although your child is minor candidate you can open saving bank account on your child’s name. Ask your child to spend some time to visit bank and deposit small amount like 500 rupee every month in to this account. Just keep them motivated to build up good bank account balance apart from depositing money to piggy-bank. Game is best way to teach children’s. To teach finance you can go with same concept by playing related to finance. Games like “New Business” concept of dealing with money in this game will help children to grab attention over finance. 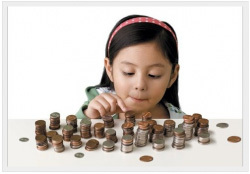 Set goals in front of your child and teach them how to achieve it if you teach them about savings goals, they’ll probably learn this lesson on their own. It’s common sense, and kids are smart enough to figure it out: if I want to get to a goal faster, I have to save more … which means spending less on other stuff. But it’s worth reinforcing with a discussion about spending and saving, and by talking to them about the decision they’re making every time they spend money. Teach your child that money placed in piggy bank will not grow but money placed in saving bank account will earn interest and can grow. Teach them about investment and show them how they can put their money in certain investments, and how those investments will grow over time. Teach your kids what it means to budget by breaking it down to a level that they will understand. Maybe they buy lunch at the canteen two or three days a week? Set a budget for their lunch money, and demonstrate to them how spending less will add in to saving. Ultimately money saved is money earn. Make it simple and easy, so they don’t grow up thinking that budgets are hard and onerous (like many of us grew up thinking). If they get into the habit now, it’ll pay off huge when they grow up. This probably isn’t a lesson they can understand when they’re 6 years old, but when they’re teen-agers, they can grasp the concept. You’ll need to discuss things like loans, credit cards and other debts. If you have a savings goal, you can reduce your expenses to get there faster … and you can also earn more money. They can start learning this lesson at a young age, by earning extra money. May be by doing small job part time of may be giving tuitions. With a little imagination, and lots of positive reinforcement, your kids will soon be well on their way to becoming financially responsible, and learn a life skill that they will value for the rest of their lives. So on October 31st, while you’re handing out candy to the kids, don’t forget to hand out some good savings advice too.